The RockBLOCK 9603 allows you to send and receive short messages from anywhere on Earth with a clear view of the sky. It works far beyond the reach of WiFi and GSM networks. Maybe you want to transmit weather information from mid-ocean? Or use it to control your robot in the middle of the desert? Perhaps you need to communicate in an emergency, when other networks might not be available? RockBLOCK can help. RockBLOCK 9603 is the smaller version of the standard RockBLOCK Mk2. It has the same capabilities, but is specifically designed to be as small and light as possible. The RockBLOCK 9603 is targeted primarily at systems integrators and product developers, where space inside your enclosure is at a premium. It has a small form factor Molex connector to link the serial, power and signaling lines to your controller. This may be marginally harder to use for hobbyists than the 0.1" dot pitch header used on the standard RockBLOCK product. At the heart of RockBLOCK 9603 is an Iridium 9603 modem. The RockBLOCK hosts the 9603 and provides it with an antenna and power supply requirements. It exposes the modem’s serial interface via a breakout connector over serial, and offers an SMA connector for external antenna usage. 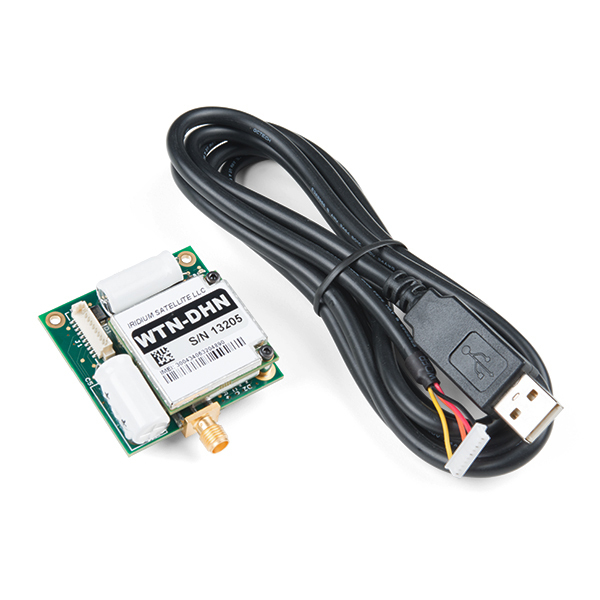 Please be aware that even though the RockBLOCK 9603 is a fantastic SatComm module, it isn't a GPS device. You will need to use your own GPS if you need accurate positioning data. 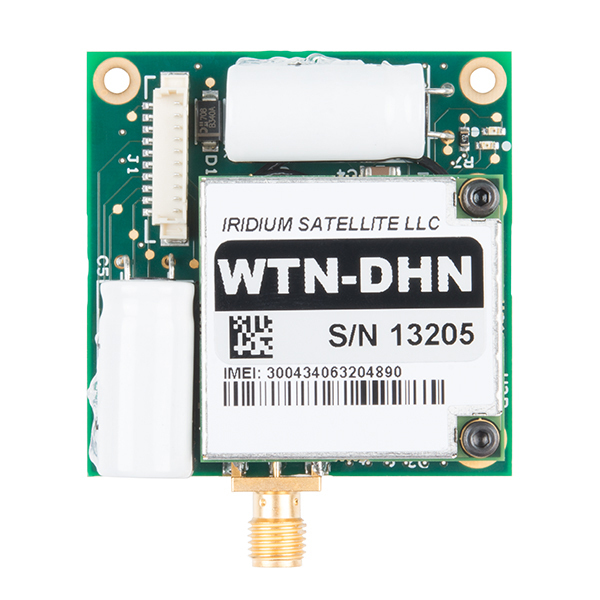 Note: The RockBLOCK does require a monthly rental service to exchange information with the Iridium satellite network. You only pay for months in which you wish to use the RockBLOCK. No annual contract is required. Line rental costs £10GBP (about $13USD) per month and includes access to the RockBLOCK management system for managing your devices. The billing system is built-in, and allows you to pay for only what you use. The SMA connector for an external antenna is not enabled by default. Instructions for enabling the external antenna connector can be found here. Can anyone recommend an external antenna for this? Ideally, pre-wired with a female SMA? According to the data sheet for this Rock Block, that is the correct connector (10 pin PicoBlade). I'm just wanting a pre-crimped wiring harness. Check the rock7 web site.. They have what you are looking for. I second the need for SparkFun to source the connectors! Currently Â£11 for every 5000 bytes sent through those Falcon 9 payloads. The cult of Elon is still super expensive. 14 cents per 50 byte message tx/rx to any place the world. Not too bad if you ask me. This fills a niche getting short messages, or small amounts of data/telemetry to and from far corners of the earth. I have used a couple of the 9602-based RockBLOCKs and have a had a very positive experience. But I seem to recall from discussions on the arduiniana.org site that the IridiumSBD library for Arduino was not compatible with the 9603. I also see that Mikal Hart has released v2.0 of that library on github. Does anyone know whether that new version is compatible with the 9603? Yes, the v2 of IridiumSBD works with Rockblock 9603. I've used and don't recommend using the older version of the library. Elon has plans for his own constellation. This is all Iridium pricing on a cheaper ride for a polar orbit on the Falcon 9's. This looks great, but after searching on the web for a pre made Molex 51021 10 pin pico blade cable, I got nothing. Could Sparkfun add a pre-made cable to its offerings? We're working on one. Stay tuned! I made a pcb adapter board for this that you can order from Oshpark with parts from Digikey. Had this up and running in 30 min or so... Works reasonably well, although the GPS accuracy is very low, and likely unusable for most applications at +/- several kilometers. Hello, and thanks for the review! It’s important to know that the RockBlock is NOT a GPS and is not intended to give accurate GPS positions. The coordinates provided are a rough approximation of your true location and not intended for precise positioning. If you need accurate location data, you should look into using a GPS and transmitting latitude and longitude along with any other data you’re sending. The Rockblock is easy to work with and its all-in-one architecture can be powered off a LiPo, Plus it has an integrated Iridium antenna. 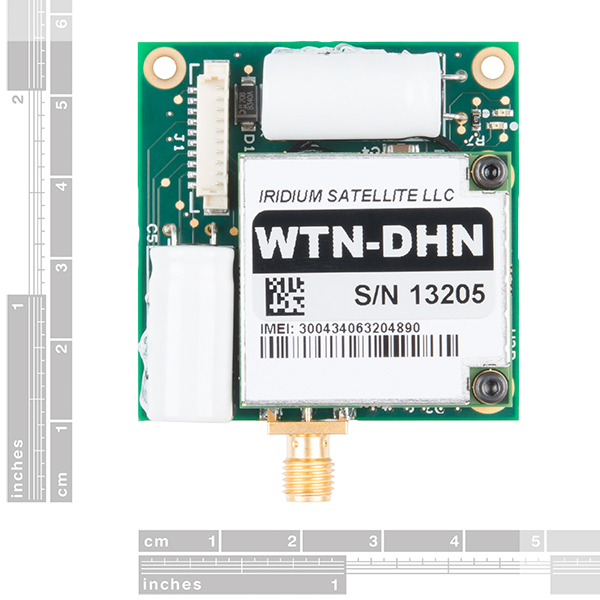 Having worked with other Iridium satellite providers, the best feature of the Rockblock is Rock7's website for provisioning and managing the modems. It is easy to turn them on and off as needed to control the monthly billing, and to control where messages go via email and/or webhook. Its a good product but has a gps problem with the latitude and longitude are wrong all the times. 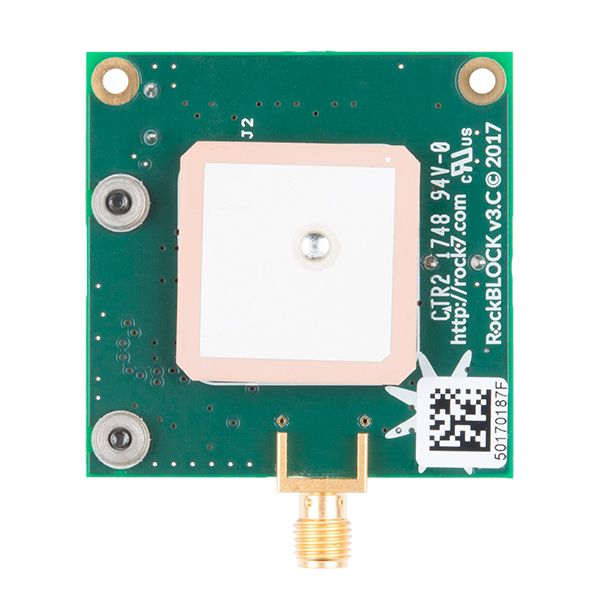 Please be aware that even though the RockBLOCK 9603 is a fantastic SatComm module, it isn't a GPS device. You will need to use your own GPS if you need accurate positioning data.